The distinctive shape of "runes" derives from carving the runes. Straight lines are much easier to carve than curves. When carving runes on wood, vertical lines can easily be cut across the grain of the wood, but horizontal lines (along the grain) are likely to either split the wood or be difficult to read. We don't know how much early Dwarves carved on wood, but we do know the practice was common among early northern Europeans, whose runes Tolkien used as models. However, when someone writes with a pen in a runic script, those constraints no longer apply. We do have some of Professor Tolkien's thoughts on what his runes would look like when written with a pen. In The Treason of Isengard (History of Middle Earth, volume VII), Christopher Tolkien describes some notes his father made "from the period shortly before the beginning of the Lord of the Rings -- more or less contemporary with the Quenta Silmarillion," discussing runes. At this point, Professor Tolkien was thinking primarily of Elves using runes, but we know, from the Book of Mazarbul found at Balin's tomb in Moria, that Dwarves did sometimes write their runes on paper. I here add the written forms of the runic letters to my previous charts. Most of the letters are shown in two versions, one approximating more closely the original runic shapes, and one showing a more "handwritten" effect. Tolkien continued to revise his runic alphabet after these notes were made, so not all the letters published Appendix E to Lord of the Rings, have "written" versions. I think you will probably be able to easily fill in the missing letters, if you use these forms. The pale green lines show the "base line" for lining up letters, just like the lined paper I learned on in elementary school. Don't worry about how it translates. It uses a slightly earlier version of which sounds are associated with each letter. (Also, it is in Sindarin Elvish.) I include this to show you how the letters look. In the same notes, quoted in Treason of Isengard, are included some additional characters Professor Tolkien modified to represent sounds in English. In particular, English has more variations in vowel sounds than any of the languages of Middle Earth. Nice compilation of info! Much thanks. 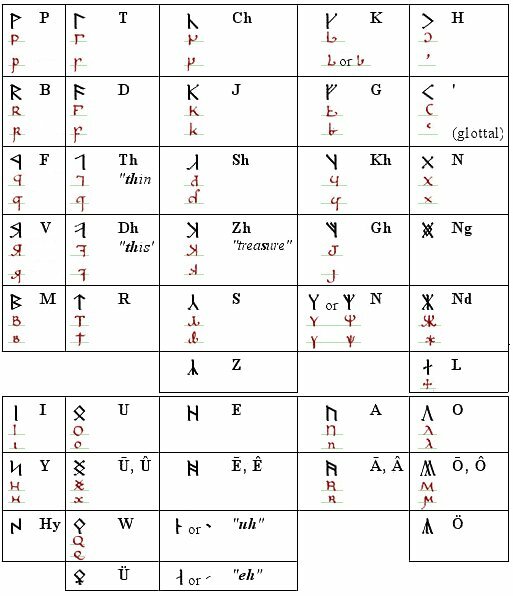 I do have a question though: If one wants to write modern English in runic, is this alphabet the most common one used among the Tolkien fandom? From what I understand, there are a few different variants, mainly between the dwarves of Moria and Erebor. Which is the modern 'standard'?